The Catfishes belong the order Siluriformes; a diverse order that contains a long row of different families. Despite what many people think, a fish doesn’t have to be equipped with prominent barbles (“whiskers”) to be a catfish; the members of the order Siluriformes are defined by certain features of the skull and swimbladder. Catfishes are found all over the world in freshwater, brackish water and saltwater. Before you get a catfish for your aquarium it is important to research that particular species since the preferences and requirements varies greatly within the order Suliformes. The taxonomy of catfishes is changing rapidly as we learn more and more about this order. Species are moved back and forth between various genera and new species are added continuously. You might therefore find seemingly contradictive information if you read older texts about keeping catfish in marine aquariums. Between 2003 and 2005, over 100 new catfish species were named and in 2005 a whole new catfish family was discovered in Mexico, Lacantuniidae. Hopefully, the All Catfish Species Inventory (ACSI) will help bring some order to the scene in the future. A majority of the known catfish species inhabits shallow, running freshwater habitats, such as rivers and streams, but there are also brackish and marine species. Numerous marine species can be found in the families Ariidae and Plotosidae. The members of Ariidae are commonly referred to as sea catfishes. These catfishes live mainly in marine waters, but the family does occur in freshwater and brackish water as well. Many species will venture into freshwater and some species are found in freshwater only. Ariidae catfishes live in tropical and subtropical waters all over the world. Some of the smaller species have been successfully kept by home aquarists, e.g. Berney's (Arius berneyi, earlier known as Arius cleptolepis), Blue catfish (Arius graeffei, earlier known as Arius australis) and Colombian shark catfish (Sciades seemanni, earlier known as Hexanematichthys seemanni). In Ariidae species, the male will normally carry the eggs in his mouth until they hatch. The eggs are comparatively large. In 1972, the Shedd Aquarium in Chicago received worldwide acclaim when they became the first to successfully breed Ariopsis felis in captivity. 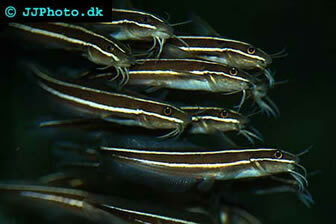 This is the eeltail catfish family, where all the catfishes have elongated eel-shaped tails. They are native to Australia and New Guinea and roughly half of the 35 known species live in freshwater. Be careful when handling eeltail catfish because some of the species can deliver a serious sting and a sting from Plotosus lineatus can even be lethal.